The onset of winter is just around the corner…but we’ll take every opportunity we can to hold on to autumn! We thought you might feel the same way – so we’ve prolonged the season by creating this free fall-themed rhyming activity for your school-based therapy classroom or telepractice session. 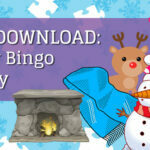 >> Download this free resource now! Each box contains two words that rhyme. Have your school-based therapy student name each item aloud, and circle the two that rhyme. Next, have him/her practice including adjectives by having them provide one descriptor per item (e.g., red hat, yellow leaf, small cat). 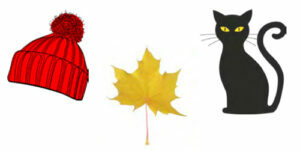 You can also have students create a sentence using one, two, or all three items (e.g., I found a red hat and a yellow leaf when I walked my black cat). This free downloadable activity is sure to engage students by encouraging phonemic awareness, while celebrating the beautiful sights of autumn. Special note: yes, this worksheet works well as a printed handout…but did you know that you can upload activities like these into your TheraWeb online therapy sessions to use with online therapy students? The TheraWeb interface has many great interactive tools students can use, including a pen tool, so they can circle the rhyming objects right on screen! To see these tools in action during actual online therapy sessions, check out these videos! We hope you enjoy this free download and are able to use it in your school-based therapy and online therapy sessions. And of course – let us know your thoughts in the comments below, and share with your friends and colleagues! Want to get more free resources (and articles!) sent to your inbox? Sign up to receive our monthly eNewsletter!